One of the most famous contributions the Chinese made was their discoveries on the unknown universe that even scientists today still ponder about. One of the main questions that developed throughout history was how the moon got its mysterious and fascinating glow. The Chinese were the ones who came up with the true idea 2,210 years ago, the suns light reflecting of the surface of the moon. Why would they want to discover things about the moon? The main reason they wanted to learn and discover more about the moon was because almost their whole culture entirely revolved around it. Even though Chinese knew why the moon had phases and why the moon sets and rises, there are many legends and stories of the moon and how it gets bigger and smaller, why it rises and sets, and even how it became to be the moon. One of the famous stories about the moons phases is called " The Man". "Wu Kang was a shiftless clever fellow who changed his anticipation ships all the time. He started out as a farmer. On seeing his crops growing with no difficulty, he decided that farming was not enough of a challenge, and so he apprenticed himself to a furniture maker. On being told by his master that in another three to five years, he would be able to make a reasonable furniture; he gave up and decided to take up business. He then went to work in shop where a similar situation occurred, so he again gave up and decided to be an immortal instead. 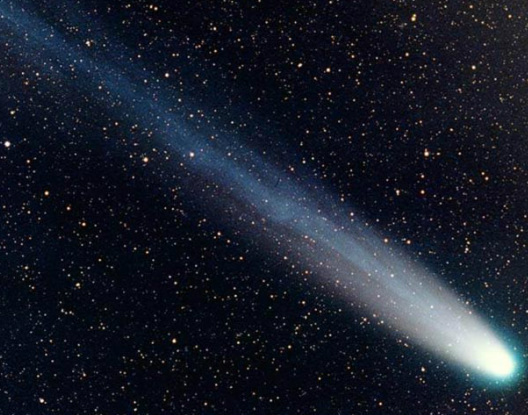 In ancient times, comets were considered the most remarkable source in the sky, because they are unlike any other object in the night sky. Also, unlike constellations, comets could not be predicted making them even more exciting. However, to Chinese astronomers comets were to be kept very good record of. Unlike the rest of the world at the time, the Chinese took and kept records on the mysterious appearances, paths, and disappearances for hundreds of years, dating back to the Han dynasty ( 206 BC to 220 AD), which described comets as "long-tailed pheasant stars", "broom stars" or " vile stars". In ancient China, the solar and lunar eclipses were regarded as heavenly signs that would foretell the future of the Emperor; predicting eclipses were of high importance. The solar eclipses were believed to have occurred when a legendary celestial dragon devours the Sun. They also believed that this dragon attacks the moon during lunar eclipses. One Chinese record states "the Sun has been eaten". The ancient Chinese would even bangs pots and drums to try and scare away the dragon.